Geoffrey Moore is an author, speaker, and advisor who splits his consulting time between start-up companies in the Mohr Davidow portfolio and established high-tech enterprises, including Salesforce, Microsoft, Intel, Box, Aruba, Cognizant, and Rackspace most recently. His life’s work has focused on the market dynamics surrounding disruptive innovations. His first book, Crossing the Chasm, 3rd Edition: Marketing and Selling Disruptive Products to Mainstream Customers, focuses on the challenges start-up companies face transitioning from early adopting to mainstream customers. It has sold more than a million copies, and its third edition has been revised. A majority of its examples and case studies reference companies come to prominence from the past decade. Moore’s most recent work, Escape Velocity: Free Your Company’s Future from the Pull of the Past, addresses the challenge large enterprises face when they seek to add a new line of business to their established portfolio. It has been the basis of much of his recent consulting. Geoff has a BA in American literature from Stanford University and a PhD in English literature from the University of Washington. Morris: Before discussing big data and RFID, a few general questions. First, as you reflect on all that has – and hasn’t –happened in the global marketplace in 2014, what do you consider to be of greatest significance? Please explain. Moore: If I had to pick only one, it might be the change in leadership at Microsoft. It has freed the company to explore a variety of different roles and relationships at a time when enterprise CIOs are particularly concerned about how to manage the expansion of the IT footprint into Cloud, Mobile, Social and Big Data Analytics. Microsoft is uniquely positioned to make a big contribution here if it can realign its assets to meet the new set of demands. Morris: In one of Tom Davenport’s recent books, Judgment Calls, he and co-author Brooke Manville offer “an antidote for the Great Man theory of decision making and organizational performance”: organizational judgment. That is, “the collective capacity to make good calls and wise moves when the need for them exceeds the scope of any single leader’s direct control.” What do you think? Moore: Well, since “great man” eliminates half the human race, I certainly think it does need to be replaced in some fashion. And there is no question that management is becoming a much more collaborative enterprise, especially as we move away from supervised co-located workforces and toward more virtualized organizations and workflows. That said, when big bets are in the works, and the forces are unstable and hard to read, I do believe that a single individual needs to be at the tiller. Ideally, that person listens well, but also ideally, they are confident enough in their principles to make clear calls in a timely manner. I do not think a group can do this. Morris: Here’s a brief excerpt from Paul Schoemaker’s latest book, Brilliant Mistakes: “The key question companies need to address is not ‘Should we make mistakes?’ but rather Which mistakes should we make in order to test our deeply held assumptions? '” Your response? Moore: When the outcome is not mission-critical, and the issues are nascent, for sure “fast failure” is part of a winning modality. The mantra I would add here is “Win, or learn.” Organizations that hold all efforts to the same standard are severely hampered in this kind of situation. Once you are driving to produce mission-critical outcomes, however, failure is not an option. Now if the forces are still nascent, you have to provision the effort in such a way that you have multiple back-ups. This drastically reduces the number of disruptive, mission-critical initiatives one can — or at least should — undertake. Morris: Looking ahead to 2015, what do you think will be the single greatest challenge to CEOs? Why? Moore: The challenge I am focused on for this decade is, how can an established market leader in a mature category catch the next wave? I don’t know it if is the single greatest challenge, but it is sufficient to keep me busy full-time for sure. Moore: I laid out the problem statement in my last book, Escape Velocity. Now I am in the process of writing a shorter, crisper playbook for how to organize, measure, and compensate teams to actually get this done. Morris: Now please shift your attention to big data. In your opinion, why has interest in it increased so rapidly and extensively in recent years? To what extent have disruptive innovations (e.g. social media technologies) been a major factor? Please explain. 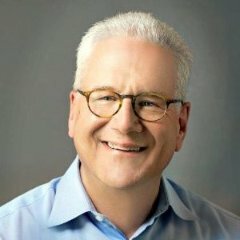 Moore: Google, Facebook, and Amazon have each applied Machine Learning to Big Data to effectively eviscerate entire industries, driving all the established sector leaders back on their heels. Moreover, it seems pretty clear that this is just the beginning, so the wait-and-see option is looking pretty scary. Morris: What are some of the most common misconceptions about Big Data? What in fact is true? Morris: Based on what I’ve learned thus far, the term “big data” seems to be a misnomer. While its size receives all the attention, the most challenging aspect of big data seems — at least to me — to be its lack of structure. What do you think? Moore: I am with you. The reason lack of structure is so important is that we already have the ability to analyze structured Big Data in a timely fashion. It is the unstructured (or rather, non-tabular) data that really are driving this new set of use cases, specifically the log files that sit behind the social graphs, the internet of things, the behavioral targeting, and the like. Morris: There’s a lot of talk about Big Data, but when you look at retail stores, inventory accuracy is just 65 percent. Supply chains struggle with inventory accuracy, shipping accuracy, and other problems. What’s the value of big data if a lot of the data is inaccurate? Moore: Actually, this is a different problem. Big Data is orthogonal to Bad Data. But there is an important point to note here. Bad Data claims to be Good Data. Big Data does not make any claims at all—it is just digital exhaust. Moore: Yes, this is the whole point. My one concern is that we not move away from the static stuff — it is still quite useful — but rather, that we commit increasingly to the real-time data-informed machine-enabled decision making. Moore: I think this is probably the pendulum swinging too far. But the point about migration is very real. Marketplaces are migrating from physical to digital locations, which does enable disaggregation of workloads, outsourcing to specialists, and the like. R.H. Coase had the right formula for the limiting factor here. It is transaction costs. At some point outsourcing imposes more cost, risk, or latency than doing it yourself—that’s where the new inside/outside boundary reestablishes itself. Moore: Prediction is not really the goal. Fast adaptation is the goal. Darwinism does not require you to know in advance. It requires you to respond in a flash. Moore: Right idea, but the last sentence overstates the outcome. If Eric were actually correct, a reasonable number of money managers would outperform the stock market indexes. But they do not. Once again analytics do not predict. They enable quick recognition of something that was not anticipated but has in fact occurred. Moore: I think even quantifying the amount of data is a mistake. I think you want to start with decisions or bets you want to make, and then work backward from objectives and achievables to information that could improve your odds, and then to mechanisms that might generate that information in a timely manner. You would get to the data eventually, but it is never really about the data. Rather, as I have already suggested, it’s what you do with the data. Morris: Now please respond to some questions about radio frequency identification (RFID). When did you first become aware of it and what were your initial reactions? Moore: Sometime in the 1990s, I believe. The first client I worked with in earnest was Savi, which had a very high end tag sold into the Pentagon. The company was subsequently acquired by Lockheed Martin. My reaction was that location and container contents were both powerful sources of value creation, and the initial application (pre-chasm) was compelling—namely, now that we have shipped all these containers full of stuff into a combat zone, where exactly are medical supplies? Morris: In your opinion, what are the most common misconceptions about what RFID is and does? What in fact is true? Moore: Like all location-based promises, it turns out the physical world plays many more tricks on us than we realize. Even after adding Wifi, Bluetooth, GPS, and all the rest, location promises are still deliverable only within significantly constrained conditions. That said, when those constraints are met, the results are transformative. With respect to inventory management, the same issues apply—within constraints, magic, elsewhere, not so much. The big challenge overall, the one that the Internet of Things will be taking on, is how to scale to virtual ubiquity. It turns out you have to do this on someone else’s budget. Smartphones and tablets were scaled on someone else’s budget—that’s what makes mobile credit card readers viable. Free WiFi isn’t free—but it is to you if someone else pays for it. The core challenge that RFID faces is that it has to scale itself on its own budget. That has limited to date to high-value use cases. Morris: In your opinion, what are the 3-5 greatest potential benefits of an RFID system? Please explain. Moore: RFID reminds me of Tandem non-stop computers, of Radius monitors that could pivot between Portrait and Landscape, of Grid laptops that you could drop without breaking, or of those wonderful toolsets where you get 101 different adjustable heads for every possible nut, screw, or bolt on the planet. When you need them, nothing else will do. But they do not scale to a general purpose infrastructure. So, tagging livestock (or pets), tracking containers, protecting luxury inventory in specialty retail—all compelling apps. Morris: What are the most serious mistakes made when selecting an RFID system? Moore: It is not about selecting the system. It is about targeting the right applications. The biggest mistakes in RFID were made by investors, not customers. Many of us thought that these tags would become the Internet of Things. It is possible even today that they still might. But the scale, the amount of commoditization needed, has to be driven by forces outside the industry itself—like the way Amazon drove cloud computing standards, or the way that Apple drove mp3 standards. Morris: I recall a time years ago when public school systems made an enormous investment in AV equipment and programs, only to learn to their dismay – after a few years — that a majority of classroom teachers made little (if any) use of the resources. In your opinion, to what extent could that become a problem with RFID systems, once in place? Please explain. Moore: The challenge is when you deploy any niche technology at a mass level. You cannot train people on this—the budget won’t ever cover it. So they have to be already trained. The good news is that Apple iPhones and Facebook and Google and Twitter have already trained literally billions of people in a whole host of UI and UX conventions. For RFID systems to persist, the edge has to commoditize to virtually free, the intermediate zone has to be built on de facto standards that are inherited for free, and then, and outside of niche cases only then, can the high-value analytics and real-time transaction execution applications seize the day. Moore: Highly relevant. Complex niche technologies—think eCAD for example—do not ever “tornado.” We call them “bowling alley forever.” They generate valuable niche markets and sustain companies with revenues of hundreds of millions of dollars. But they never fully commoditize, which is the precondition for tornado distribution. I think the toughest challenge RFID faces is that we always expected it to tornado and thus we have yet to appreciate how valuable it is as a bowling alley play. Morris: What about the “crossing the chasm” metaphor? Moore: RFID has definitely crossed the chasm. That is the transition from the early adopter “project” phase to the early majority “solution” phase. In the use cases where it has gained adoption, it solves very real problems in effective and efficient ways, hence it is very sticky. Morris: Do you see RFID as potentially providing better information on what’s happening in real time to physical inventory, assets, tools, work-in-process and other things companies struggle to track today? Morris: Apparel retailers large and small are turning to RFID to improve inventory accuracy. Do you see this as the first sector likely to reach mass adoption of RFID and do you foresee that propelling use in other sector? Please explain. Moore: For luxury goods, yes, probably more for preventing shrinkage than accuracy of inventory. But in general, not anytime soon. There is still too much frictional overhead in the process to make it truly scalable. Morris: It seems the RFID industry is struggling to create a “whole product,” one of the key developments necessary for a new technology to achieve mass adoption. Do you see the slow pace of RFID adoption to date as a result of the complexity involved with putting together a solution? Moore: No, I think the industry does put together whole products. I just think it takes too much work. What it does not get to do is inherit someone else’s whole product features easily. Every smart phone comes with Google search for free. That adds a ton of value to the smart phone. You don’t get that sort of thing with RFID. Morris: Here’s a follow-up question. Do you see that changing? Moore: For the Internet of Things to work, it has to change. Whether that will be a derivative of RFID or some other technology is the question. Morris: There’s a lot of buzz about the Internet of Things, a term that was coined originally to explain the value of putting RFID tags on cases, pallets, and shipping containers in the supply chain. What is your own perspective view on the IoT? Moore: This decade is being characterized by four global game changer technologies: Social, Mobile, Analytics, and Cloud (SMAC). IoT will be the fifth horseman of the apocalypse, arriving a bit later to the party. All five enable the digitization of modern life and culture, end to end. We are mutating even as we speak. Morris: Given that the “Internet of Things” covers a lot of different technologies — radios to connect things to the Internet, software to allow machine-to-machine communication — do you see it as a technology that can tornado, or is a series of individual technologies that will achieve mass adoption? Moore: To be meaningful at scale it has to tornado. Morris: Some RFID companies are trying to rebrand themselves as IoT companies. Do you think this is a smart strategy? Moore: Well, ontologically they are part of the Internet of Things, so it is not lying. The issue is expectation setting vis a vis bowling alley versus tornado market dynamics. Just calling yourself IoT does not get you into the tornado. Morris: In Crossing the Chasm you say that for a technology to reach mass adoption, there must be a problem it solves that no other technology can solve. For RFID, there are many. For example, retailers have always struggled with inventory accuracy. Hospitals have always had problems locating medical equipment, and aerospace companies have struggled to track the history of parts. Here’s my question: Is the fact that RFID can solve these and other problems one of the problems it faces in crossing the chasm? Please explain. Moore: Per my earlier answer, RFID does not struggle with the chasm. The applications you refer to are excellent bowling alley use cases. The challenge is finding the killer app that crosses virtually all use cases, the one that can drive scaling at three to four to possibly five orders of magnitude beyond what we see today. Morris: Many people have become frustrated because they think RFID adoption has been unusually slow. It’s been about 10 years since the passive UHF Electronic Product Code standard was created. What is your view? Has adoption been slower than normal? Please explain. Moore: Niche markets burn more slowly than mass markets. Laser technologies have traced a similar curve. Bits can proliferate very quickly. It’s when they get attached to atoms that things slow down. Morris: In your opinion, have RFID companies contributed to the slow pace of adoption by providing generic tracking solutions rather than building a whole product for specific industries? Please explain. Moore: No, I don’t think RFID companies are making mistakes. As indicated, I think RFID investors are. Morris: It would seem that the trend toward cloud computing, big data, and RFID are all converging. Do you see the ability to capture massive amounts of data with RFID — and to analyze and share it anywhere globally — as the next wave of IT innovation? If not, what do you see as the next big wave? Moore: This is the Internet of Things, and as SMAC tornadoes begin to subside, it is the next great disruption in the wings. Morris: Of all the great innovators throughout history, with which one would you most want to share an evening of conversation if it were possible? Why? Moore: For me, it would be Shakespeare. His innovations with character and language shaped the subsequent history of English literature as much as the microprocessor has shaped the technology landscape. I would really love a conversation in which I could see how he thought. Morris: Let’s say that the CEO of a Fortune 100 company is determined to strengthen a workplace culture within which personal growth and professional development are most likely to thrive. Where to begin? Moore: I think the first step is to create four zones of management—two for disruptive innovations, two for sustaining innovations, each divided into mission-critical and enabling sections. Each zone has dramatically different imperatives, success factors, key metrics, management solutions, etc. etc. I am in the middle of sorting this out with some key clients and will be writing more about it shortly. Much of the frustration in modern corporate life comes from being in the right zone under the wrong management system. Morris: For more than 25 years, it has been my great pleasure as well as privilege to work closely with the owner/CEOs of hundreds of small companies, those with $20-million or less in annual sales. In your opinion, of all the insights you share in your various books, which do you think will be of greatest value to leaders in small companies in 2015? Please explain. Moore: At that scale, companies have the freedom to truly excel at optimizing one thing, something that inevitably gets lost as enterprises scale to bigger sizes. The main principle to keep in mind is that the one thing (whatever it is) has to keep evolving. The easiest way to make it sure it does is to put yourself and your whole company in service to a set of target customers who have an evolving set of reasons to buy, ones that you are interested in and that you think need your services to address. Once you have the problems clearly in view, then you just have to commit to do whatever it takes to solve them. Morris: Which question had you hoped to be asked during this interview – but weren’t – and what is your response to it? Moore: “How did you enjoy your round of golf at Augusta?” My response being, I haven’t been invited yet but am open to the invitation! ← Is there a payoff from top-team diversity? A really good interview. The ideas on “Big Data” very insightful.